Operation Game Thief helps track down two illegally captured Harris’s hawks. Amber Rosintoski held a young Harris’s hawk in her hands, gingerly removing bandages that prevented the bird from injuring itself during its cross-country flight on Delta Air Lines. Rosintoski, director of bird programming at the Carolina Raptor Center, had traveled with two of the birds from North Carolina to South Texas that January morning in preparation for this very moment. She handed the hawk to Texas game warden David Murray, while game warden Michael Hummert held another hawk, already ready to go. While cameras rolled, the officers counted to three. The regal birds stretched their wings and flew off into the sunset. Releasing the birds back into their South Texas scrub habitat was a rewarding finale to more than two months of behind-the-scenes criminal investigation to find the stolen hawks and make an arrest. The case began when an anonymous tipster left a message with the Operation Game Thief hot line — TPWD’s crime-stopper program — that someone had illegally captured two Harris’s hawks. 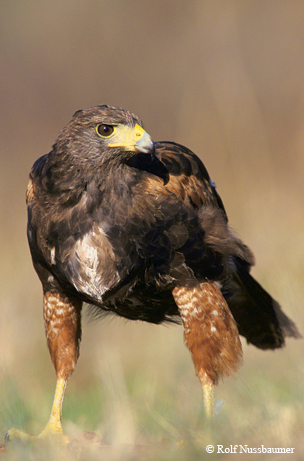 Although not an endangered or threatened species, they’re protected under the federal Migratory Bird Treaty Act, and no one can catch or keep Harris’s hawks, or any migratory bird, without a permit. Sometimes called “wolves of the sky,” these are the only hawks that hunt cooperatively, with multiple birds swooping in from the air and some hopping along the ground. Their social behavior makes the species ideal for use in falconry, but only for those with the correct permits, training and dedication to the craft — and to their birds. It takes three to six months to train for and receive an apprentice hawking license. In a fitting conclusion to the case, the regal birds were released on the Mirando City ranch of octogenarian Gene Walker, a board member of Operation Game Thief. Initiated in 1981, Operation Game Thief has helped solve more than 9,000 cases in Texas, crimes like the illegal harvesting of oysters, mussels and fish, and the poaching of deer, bears, bald eagles and other wildlife. People who submit tips leading to an arrest and conviction receive a reward of up to $1,000. Since poachers don’t buy permits and often take more than the allotted quota, poaching and illegal fishing keep vital revenue out of the state’s coffers and harm the state’s wildlife. And pursuing poachers uses money that could be used to fund research and help TPWD manage the state’s resources. Some game thieves are just opportunists, but many wildlife criminals engage in regular black market trade of animals, which may have been the case with the Harris’s hawks. The case was turned over to the U.S. attorney general’s office and is working its way through the court system, so many details remain unrevealed. If you know of a violation, call 800-792-GAME (4263), 24 hours a day.